Before the final stage of 1989 Tour de France, Frenchman Laurent Fignon (Système U) was 50 seconds ahead of American Greg LeMond (ADR). Fignon took the yellow jersey from LeMond after Alpe d’Huez stage, thanks to a withering attack by Gert-Jan Theunisse, Fignon was able to rid himself of LeMond on the ascent. 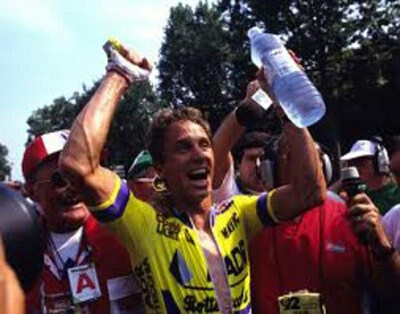 Greg LeMond, after winning 1989 Tour de France by 8 seconds. The final stage was seemed enough for the victory. 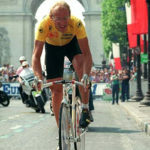 French newspapers had already prepared special editions with Fignon on the front page, preparing for his victory. It was considered unlikely that LeMond would be able to win back 50 seconds on the 24.5 km. Lemond is flying to the victory. LeMond found that there was no UCI rule dictating that aerobars (also known as tri-bars as they had previously only been used in triathlons) were banned and, as such, began using them at the 1989 Tour de France. It would prove a decisive difference. 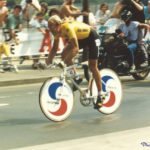 He won the time trial in stage five, using aerobars which enabled a new and more aerodynamic riding position, a new type of teardrop-shaped aerodynamic helmet in the time trials and a rear disc wheel, Fignon used normal road handlebars and a bicycle with both front and rear disc wheels, which left him more affected by cross winds. LeMond used aerobars and aerodynamic helmet also in the final stage, and Fignon did not, again. LeMond gave his best, and rode the fastest time trial in Tour de France history to date (still second fastest, only beaten by David Zabriskie in 2005 over a shorter course), averaging 54.545km/h whilst pushing a massive 54×11 gear. LeMond chose to ride all out, not allowing any radio contact (other than encouragement) from the team car at all. Fignon, by contrast, was getting as much information as possible. Fignon had developed saddle sores in stage 19, which gave him pain and made it impossible to sleep in the night before the time trial. As LeMond finished and the clock began ticking, Fignon entered the the Place de la Concorde still in front (virtually) by 2 seconds. However, he began to falter on the shallow climb up to the top of the Champs-Elysées, losing time before the turn around and finish. 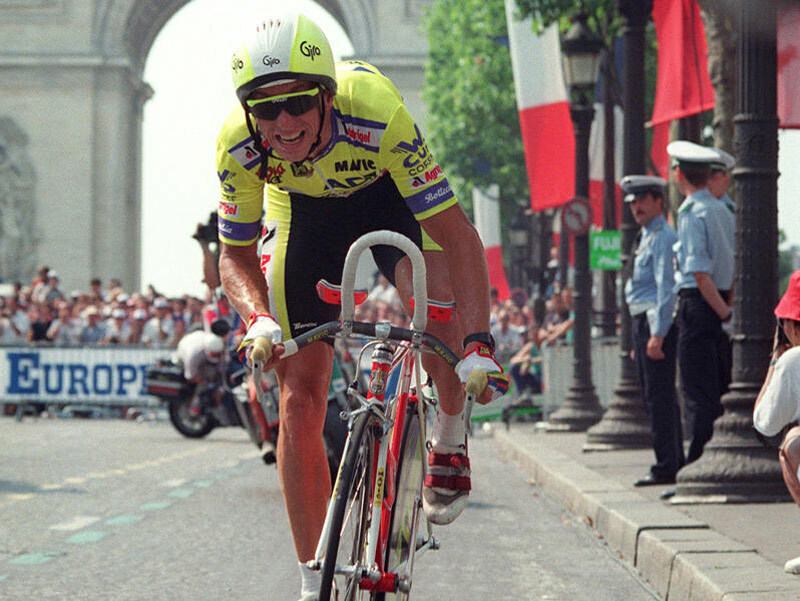 It was just enough to allow LeMond to grab yellow and win an epic Tour de France. The final margin of 8 seconds is the closest finish to a Grand Tour in cycling history. After 3,288km, only 150 meters separated Fignon and LeMond (0.00456% of the race distance). It was suggested afterwards that if Fignon had cut off his ponytail, the reduction in drag might have been sufficient for him to have won the Tour. 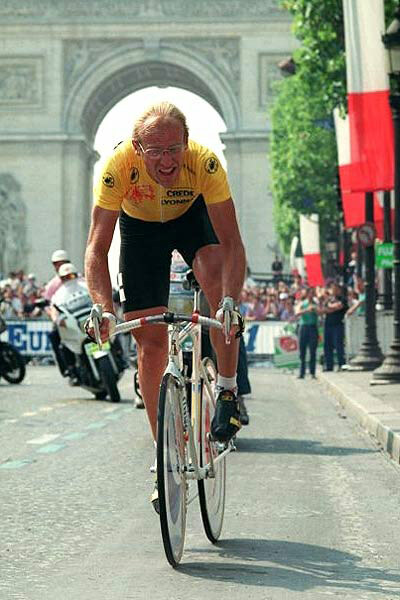 Fignon began to falter on the shallow climb up to the top of the Champs-Elysées. Greg LeMond is flying to the victory, Tour de France 1989, stage 21. Laurent Fignon didn’t use aerobars and aerodynamic helmet. 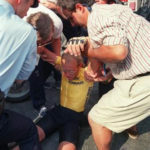 Fignon collapsed after crossing the finish line. Tour de France 1989 podium: 1- Greg LeMond, 2- Laurent Fignon, 3- Pedro Delgado. Delgado was defending champion.